It’s been a great year for composer Pinar Toprak so far. With Syfy’s “Krypton” set to premiere tonight (March 21 at 10 ET/PT), Fortnite is also sitting atop Apple’s gaming app store. 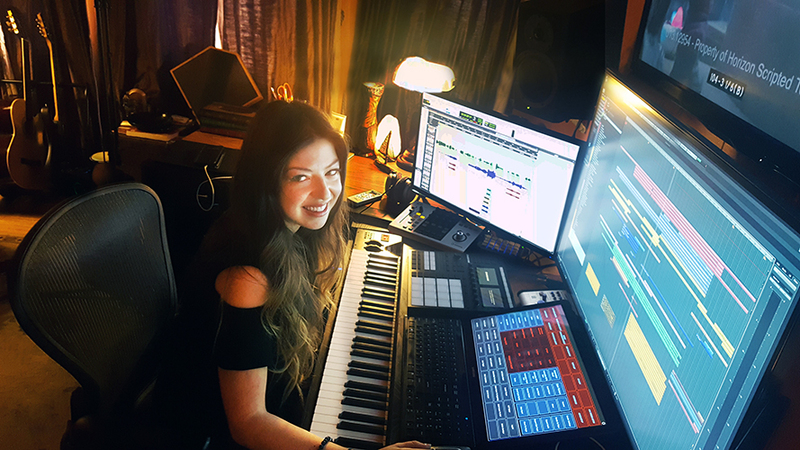 Recently, Pinar composed additional music for the superhero ensemble Justice League. I was lucky to grab some minutes with Pinar Toprak to talk about her work on one of the year’s most anticipated TV series Krypton, which is set two generations before its destruction, and the surprising success of a game that is taking the world by storm. Krypton is finally premiering this week. What was it like scoring the series? Pinar Toprak: It’s a wonderful experience. I’ve been a Superman fan since childhood. Its surreal. Every day I get to work on it. It’s amazing. I’m having the time of my life. People have preconceived notions about (planet) Krypton, usually relating to how it ended, but not many before that. Where did you draw inspiration from? PR: We wanted to do something that was different. Not what you would necessarily expect to hear because this is about Krypton. Obviously, we have the Superman legacy with us which is Superman’s grandfather. But it’s also about how they really lived and what happened then. Rather than thinking of it like a Superman film that we’re used to, I wanted to do something that is unique and unique to Krypton. So, it’s about finding different sounds and creating new music and new things, example for Brainiac. It’s really a lot of fun. Did you incorporate scores from movies or TV series based on DC comics? Did they inspire you in some way? PR: There were two moments on the first episode which will air tomorrow. There’s an homage to the Superman legacy, basically. But other than that, I wanted to do our own thing. Because this is unique, and this show has such a different angle to what we’re used to. So, it’s a whole other approach. You’re talking about John William’s Superman theme, right? I thought that’s a cool touch. PR: Yes, there are two moments on the episode that will air tomorrow. Thank you. It worked well. Is there an overarching sound for Krypton? How would you describe the overall music of Krypton? PR: We have different themes and different sounds for different situations. There’s a main Krypton theme that you will hear on the very first cue during the opening of the first episode. That develops over time towards another episode as well. There’s a main Krypton theme which is very heroic and hopeful. I think that’s the thing about Superman that I personally love. Its hope. So, I want to make sure that is carried throughout. There’s also certain patterns and motifs that I’ve set up. There’s a theme, so to speak, for Brainiac. Its not necessarily a melodic theme, but more like a collage of sounds that I created, which you can hear every time there’s a hint of Brainiac on-screen. There are different instrumentation and themes set up for all those. I was listening to Wind Gods, and they also have an epic and heroic feel to them. Did your past work influence your creative process? PR: Absolutely. As much as I love writing intimate moments, I think that’s beautiful too… but what made me fall in love with American films so to speak is this world, the big epic-ness of it. So, I particularly enjoy writing that type of style, and we have a lot of that on Krypton. It’s a very cinematic show in every way and we wanted to make sure that the music and emotion live up to it. You’ve scored for different mediums: movies, tv and video games. What is the most challenging and how is the process different from each? PR: I don’t know about challenges but there are specific things, codes we need to crack for each one so to speak. Such as… what are we trying to say or what story we’re trying to tell. But the idea is the same for all. For video games, the technicalities are a bit different because its less linear. Although we have some cinematic stuff and a lot of cues, a lot of it needs to be incorporated into the game or loop a certain way or be able to layer seamlessly from one to another. I can’t get a bit more technical in that way. What I love about TV is that I have opportunities to develop scenes and ideas over different episodes and I think that’s been a wonderful thing. Right now, I just finished working on episode 6. And it’s so nice to be able to have this outlet where I can explore. Like how characters will develop on a TV show over time, the music develops that way too. It’s been a lot of fun to see how they’re evolving together. You mentioned that you get to experiment more for that bar scene. I thought it sounded like a cool 80’s new wave techno pop. How did that come about? PR: Yes. The idea was that we have a few bar scenes and we needed source music that would be played in those scenes. But we can’t just license anything and put it on there because this is Krypton. It’s an entirely different planet. So, the idea was to create something that they would listen to, what kind of instruments, and what the sound would be. There are several source cues that are spread out, especially on the first two episodes. Its been a lot of fun experimenting with a lot of stuff. Speaking of gaming, Fortnite is also blowing up the gaming scene. This must be an exciting time for you. Did you expect all of these to happen at the same time? Not at all. Well…I hoped. I don’t know [laughs], expecting and hoping are different things. You’re always hoping for these things to do well. The timing is definitely on my side which I’m incredibly grateful for. Fortnite has been a blessing in every way and working on it with everyone involved on this game. We had a blast. Did I know how big that’s going to get? I thought it was a really cool game, but everyday I read a new story about a celebrity, and about how its breaking records everywhere. Its unbelievable. Its really gratifying. I’m glad to be a part of it. And now Krypton, being the first female composer this century to score a live action superhero TV series. How do you feel about this? There can’t be a shortage of female composers in Hollywood, is there? PR: There’s definitely not a shortage of talent. 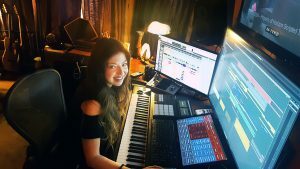 There are amazingly talented and well-crafted composers who happen to be women. But just like with everything, there are certain things in our society that we need to overcome, and this is one of them. What is the best advice you can give to anyone who want to get into film scoring? PR: The first one is to know that it’s a marathon. It takes time and patience. Its active patience, thats what I call it. You need to be patient while working incredibly hard. Be great at technology and know the new tools. Because right now, being a composer is not like how it was before. You need to be crafty and be able to do a lot of things ourselves and produce well-made scores. You need to orchestrate really well, produce great mock-ups, mix, master, a lot of things that I do daily. Just keep learning. Also, networking. You can be the best at what you do, but if people don’t know about you it’s not gonna get you that far. So, it’s a combination of a lot of things. But personally, I think what’s helped me the most, which was scary but… I never did anything else. This was the only thing I wanted to be great at. And I think a lot of times, if you have a plan B, I can guarantee you, you’re gonna end up doing plan B. So, it’s a very different way of living life knowing that this is the one thing you want to do and you’re gonna do it no matter what like your life depends on it. Cause if you believe that your life depends on it, you’re gonna work a little harder that you would otherwise. What’s the best score you heard last year? PR: I really love The Shape of Water. That was a beautiful score. Yeah. I love that one. And the best scores ever? PR: I’m a huge Ennio Marricone fan. His scores always have a special place in my heart. But the word “best” is very subjective. When I was a teenager, what appealed to me then versus now and what felt the best that day and that moment doesn’t mean it’s the best crafted. Music is such an emotional connection. In different times of my life, I love different things. But Ennio Marricone scores definitely tickled my heart in a very special way. This entry was posted in Comics, Entertainment, TV and tagged Krypton, Superman by admin. Bookmark the permalink.